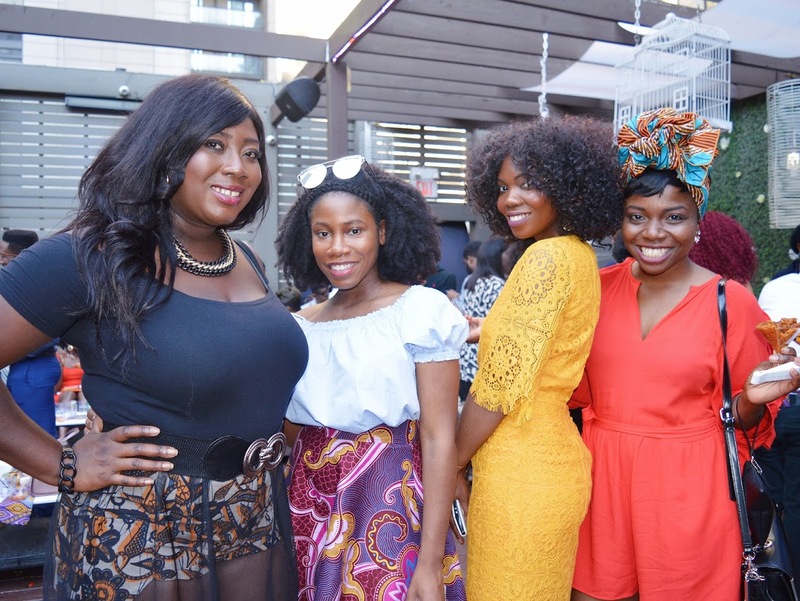 Throughout the summer, the city was buzzing with so many Afrocentric events. It felt like every weekend there was another African fashion, music or food event. I loved every bit of this and definitely made sure to attend as many as I could. One of these events was the Events by Reign African Cultural & Culinary Experience, which occurred on July 30th on te rooftop Patio of upscale downtown lounge Maison Mercer. The event consisted of exploring African cuisine through a 5 course cocktail style tasting menu. In addition, there were musical performances and attendees were to rock their stylish African fashions. I attended this event along with AfroFusion Squad member Lakshmee as well as my ticket giveaway winner and fellow blogger Abena Donkor. As the dress-code for the event emphasized 'African inspired, stylish daytime chic,' I put together this look incorporating my African print shorts paired with a sheer dress and off the should top combination. It was definitely a beautiful day for a rooftop soiree. The event was catered by various local African chefs and restaurants, which included The Golden Stool, 116 Kitchen, ChicpeasVeg, Meko, Dominion Kitchen, Lola's Catering, Twins in kitchen, and Feldos. The event space was also decorated by African home decor brand Ibile. While sampling items on the menu as the came around, attendees mingled, chated and networked. It was great catching up with some of those in attendance that I knew and also met a lot of great new people as well. There was a lot of stylish and beautiful African fashion being worn by attendees, so tried to capture a few of these great looks. Congrats to Fran and her team on a successful event. Thanks for having me and looking forward to the the next one!